Within the first week of starting my internship in the Archives Center of the Smithsonian's National Museum of American History, I was tasked with searching through the Duke Ellington Collection materials for particular scans and images. Throughout my search, I gained a better appreciation for the legendary musician as well as for jazz music and culture. Here are my top five picks of the most interesting documents in the Duke Ellington Collection, which spans the years 1927 to 1974. Several folders and boxes in the Duke Ellington collection contain hastily written, miscellaneous IOUs. It seems that during Ellington's career revival in the 1960s, IOUs were commonly used by the musician. At this time, Ellington had achieved international acclaim and, with his busy schedule, it appears he only had a few minutes here and there to jot down his financial notes. 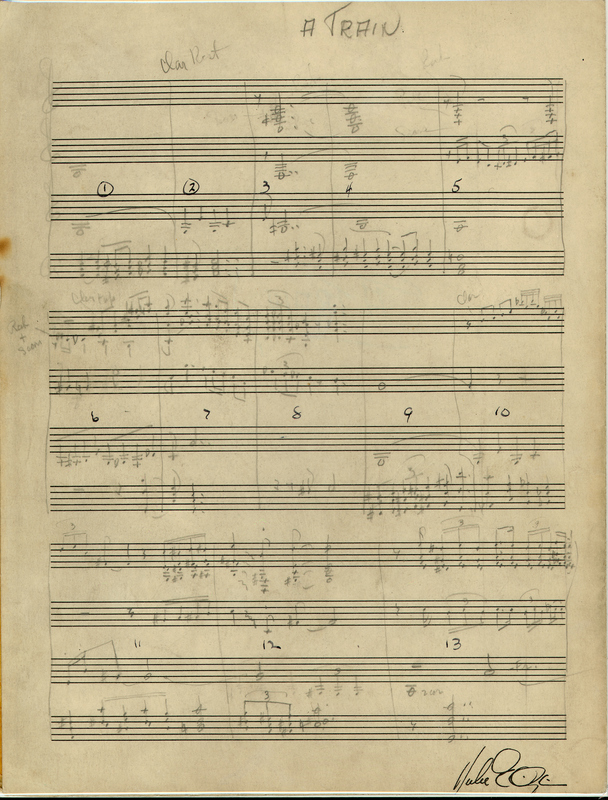 One of the largest series of materials in the Ellington Collection is Ellington's extensive business records. 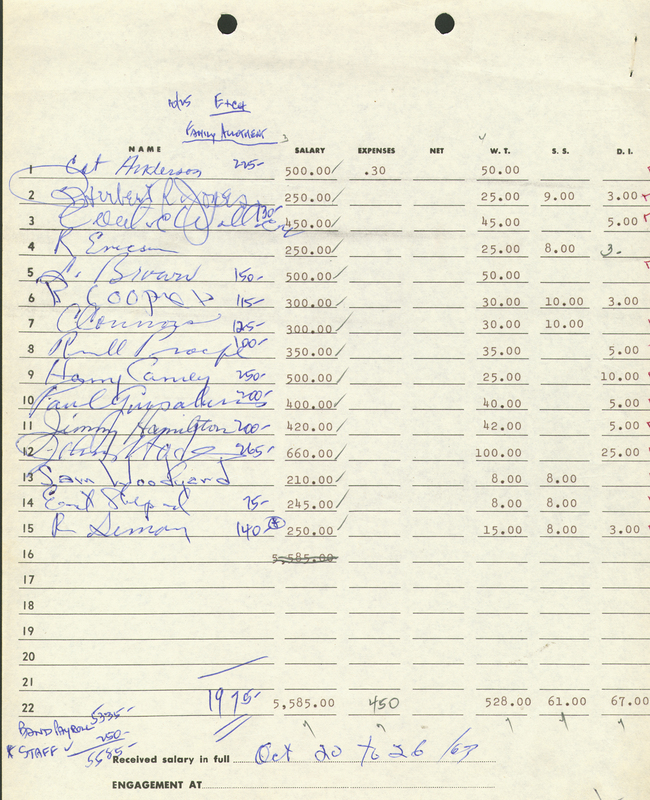 Although Ellington's name is not mentioned on this particular salary list, the business records section of the collection documents how he compensated his musicians. Cat Anderson, Paul Gonsalves, and Johnny Hodges are only a few of the many accomplished artists who performed in his extraordinary ensemble. Ellington's musical legacy would not be complete without mentioning his multiple international tours. In this 1963 photograph, he is playing the piano in India. It was during this State Department tour that Ellington became severely ill, and band member Billy Strayhorn took his place at the piano for certain performances. Despite these unforeseen circumstances, Ellington was considered a diplomatic leader, captivating and uniting international audiences during the Cold War. One popular piece that tied Ellington with Billy Strayhorn was "Take the 'A' Train." Strayhorn composed this piece in 1939 and it eventually became one of the most popular works performed by the Duke Ellington orchestra. In fact, it was the band's theme song from 1941 on. This musical collaboration between the two musicians ignited a 37-year-long working relationship between Strayhorn and Ellington. My favorite item from the Duke Ellington Collection is this telegram from Louis "Satchmo" Armstrong wishing Duke Ellington a happy birthday. Both musical giants, Ellington and Armstrong recorded the jazz album The Great Summit/Complete Sessions in 1961. The combination of their musical talents and years of long successful careers fostered an amicable relationship between the musicians. Want to learn more about the American experience through the transformative power of jazz? The museum’s Smithsonian Jazz team strongly recommends you check out their website to explore our jazz oral history collection, get tickets to performances by the Smithsonian Jazz Masterworks Orchestra, celebrate Jazz Appreciation Month, and more. Or sign up to receive a monthly jazz e-newsletter from the museum for regular reminders. Justine Thomas is a spring intern in the Archives Center at the National Museum of American History. She is a rising senior at The College of New Jersey. Sign up for the museum's jazz newsletter for more jazzy stories like this one.